This shallow rock shelter, overlooking Bonsall Moor and Blake Low to the south, is not very impressive on the whole. From the flint atefacts and waste flakes recovered during the excavation it would appear that the shelter was used as a hunting hide, a place to retreat from the elements to craft tools, rather than a habitational cave. 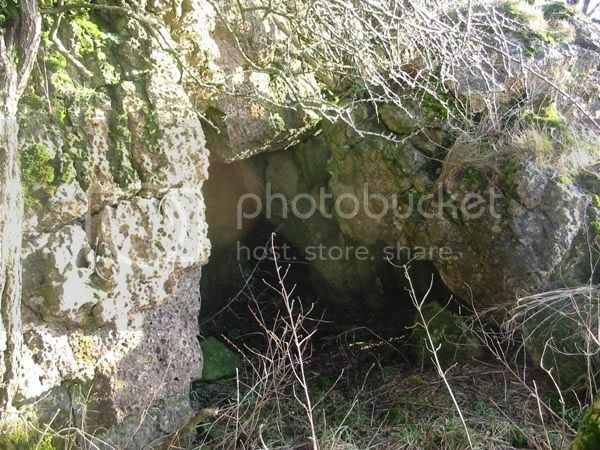 The dig report records several boulders built around the entrance making a enclosed platform but so overgrown and rocky is the area this feature is hard to identify for certain. The cave is located on private land but the escarpment and area of the shelter can be viewed from Bonsall Lane between the villages of Bonsall and Winster. Above: The limestone scarp edge.